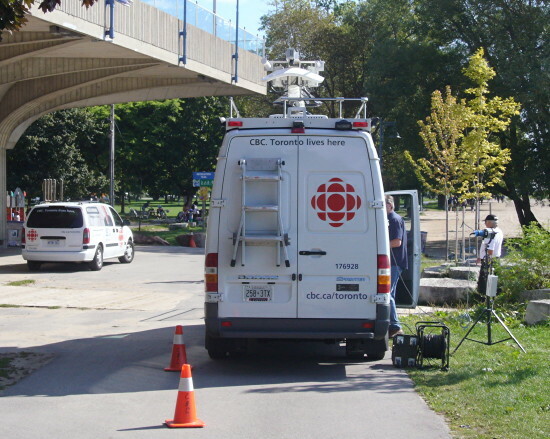 This morning in the Beach, I bumped into the Toronto posse gathering the news. I said hi. And right now in the Atlantic provinces, the new 90-minute TV newscasts go to air. News was expanded by half but budgets and personnel weren’t. News was bumped to reschedule foreign shows with high ratings into a block. A new foreign show leads into the news. Barely anybody watches TV at 5:00 or 5:30. The province with an undying, decades-long thirst for local news, PEI, didn’t get an airtime increase. This will probably not end well. You know that already too. One day last week (I think Wednesday), CBC News at Six ’s lede was the kidnapping in California. The next day, second piece in the lineup was the confirmation that MJ’s death was ruled a homicide. The former example is what I expect a station in Rochester, Minnesota or Bozeman, Montana to do: Use a network feed as an easy way to eat up three minutes. Those stations still wouldn’t be covering their own cities, but at least they’d be covering news that took place in their own country. Those stories make sense as local news only in Los Angeles. That’s a really obvious and egregious misuse of a local newscast. So obvious and egregious Ian Morrison will surely be putting out a press release, half of which might be made up. It’s a temptation to be avoided. What I’m more worried about is the temptation to cover easy, even facile stories. Like recapitulating what the local paper covered that morning – egregiously in Toronto, running out to shoot whatever was in the Greater Toronto section of the Star . Or full segments on stories that deserve at best a ten-second narrated mention with B-roll, like when a piece of glass or concrete or a sign falls off a building within walking distance of Fort Dork. How cold the summer’s been. A report spurred by a government press release, with obligatory streeters afterward. If you want to know what I’m talking about, watch CityNews at Six on the weekends on CITY-TV. It’s four minutes of something resembling news, then six minutes of Michael Serapio biting his tongue and barely maintaining his dignity interviewing kids at the equivalent of the county fair, then a couple of minutes of “international” coverage using syndicated video. The rest of the show is pro sports and weather. Aaand that’s your news. This lineup barely changes even when something major happens on a weekend, like the Sunrise propane explosion (an actual example – I watched and checked). And if you want a harbinger of this future, call up CHCH on your cable or satellite or rabbit ears. It’s under new management as of today and ostensibly it has an all-news-all-morning-and-afternoon format. They’re already covering nothing in particular, the signal looks like it came from PAL-format VHS, and the first thing to go was captioning. This is not a future I relish for CBC Television. I’m gonna suggest that the secret here is not epitomized by the old saw “do more with less.” How about doing something different? Since the CBC is now just a content company (more on that in the future), and since news desks are being “converged,” why not make use of local expertise, this time with credit? Instead of just cloning whatever’s in the paper without acknowledging it (a pre-hyperlink practice), why not cultivate relationships with local bloggers? I don’t mean Twits, I mean people who actually write 250 or a thousand words on a topic that’s happening in their own town. Because blogging space is free and functionally limitless, people cover things that used to be too expensive or picayune for the mainstream media. But now one outlet of the MSM is half again as hungry as before. In this scenario, why couldn’t the local news use bloggers as a kind of feeder mechanism, using them as early locators of developing stories and giving them onscreen credit? A lot of these stories can lead to more than one TV segment, like anything to do with zoning or city services. You don’t need to be Jane Jacobs fighting the Spadina Expressway to have a story about your own neighbourhood. Then PayPal these bloggers fifty bucks or something as a finder’s fee. And the Twits? For TV news, pictures on Twitpic or Posterous or even Flickr are goldmines. TV is visual, after all. It isn’t tricky to set up a couple of browser tabs with search terms or hashtags and just refresh them every now and then. Or, for the five people at CBC who use this miracle technology of the late 20th century, RSS works well here. 90% of these “users” are posting by shoephone and you can often just call them to find out more. You don’t need to be alongside a jetliner landing in the Hudson to document a visually interesting story. You could actually really cover technology developments, especially local technology developments (not an oxymoron anymore). Half the time the nerds can supply their own video. We already know that what the audience considers “broadcast quality” has changed, so assuming you aren’t trying to pull some kind of rights grab, put the footage on air. And arts? In anything but the very biggest cities, this could be the best thing to happen to local arts coverage in years. Suddenly you’ve got tons of space. Arts-rich areas like St. John’s and Halifax have a primo opportunity here. Areas starved for arts coverage, like the northern parts of pretty much every province, could finally get what they deserved all along. If CBC isn’t taking this opportunity to meticulously document what the Kids in the Hall are doing in North Bay, what are those extra 30 minutes good for? There’s still gonna be a bottleneck of people, cameras, edit suites, money. Those could queer even the best-laid plans. But what I’m talking about here aren’t superficial stories or piped-in video from another country. These stories are not more of the same. It isn’t old wine in new bottles. It’s new wine. Gosh, they need to, more than ever. They don’t have people qualifed to do more than those bite-sized pieces, and even the unqualified people they do have don’t have the time. This is, by design I suspect, the final act for local news. “And arts?” The CBC means nothing to artists under 40 years of age and little more to their audience. It’s no longer anything to do with that world. Nobody is interested in that sort of coverage and many resent being asked to provide free content under the pretense that it’s promotion for their work. More informed analysis of current events is the only thing that is going bring any new viewers to this moribund operation. This expansion of headline based shite is a waste of time. I think I know what youâ€™re referring to â€�� those Jelena AdÅ¾iÄ��â€��style hereâ€™s-a-bite-sized-rundown-of-current-Hollywood-product segments. But in the scenario I envision, every topic gets its own full segment because thereâ€™s more time available. 20 minutes into the CBC at 5 here’s my impression so far. Why are they still showing the news in 4 x 3? Can Diana Swain at least look happy to be reading the news. Ron Charles has his head cropped off during his hit from the news room. Minutes later they cut to Gillian Findlay in the same seat earlier occupied by Ron Charles. Gillian sat there with no IFB for several seconds then cut to her story on police corruption. The “breaking news desk” had stock video of OLG ticket buying. No fresh images from the press conference earlier this after noon. Bet thing about the first 20 minutes was Mike Wise and his i report. Taking a look at the buzz on the net. Is anyone suprised? Come on. Really.